Schooling: 6:45-7:45am Saturday and Sunday. Attire: Proper show attire required. Dogs: NOT ALLOWED!!!!! Except for service dogs. There is an aggressive livestock guardian dog on the ranch; we encourage you to keep you dogs safe at home. **7 of 8. First time used as a warm up, rider picks one jump for judge to disregard. Winner takes all! May be entered again, but just as a warm up Hunter. We will announce the current leader after each fence height change. WALK-TROT: No cross entry with any other class. FLOWER POWER: Cross entry with Pre-beginners is allowed. This is an entry-level division To be judged on position, control and attitude. Cantering will not be penalized in the jumping portion of this division.. No- judges will not be allowed on the flat. PRE-BEGINNER EQUITATION: Open to junior and amateur riders who have never shown higher than 2’0”. May cross-enter into beginner division. BEGINNER RIDER: A beginner has never won three classes over fences in the same show season, and has never shown in a class with jumps exceeding 2’6”. This division will be split by age if entries warrant. PONY HUNTER: Open to all ponies ridden by junior exhibitors. May jump either height offered, but must jump same height throughout this show. 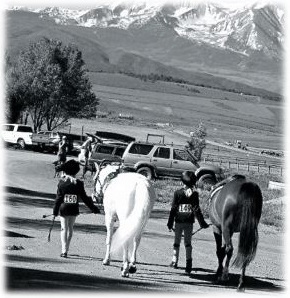 PONY EQUITATION: Open to all junior riders mounted on ponies. LONG/RUSTY STIRRUP EQUITATION:. Courses will be set at 2’0-2’3”. No rider who has competed over 2’6” is eligible for this division. LOW CHILDREN’S/AA HUNTER: This division will not be split by age. Open to horses or ponies shown by junior & amateur riders. Riders may not show higher that 2’6” at the same show. LIMIT EQUITATION: Open to junior and amateur riders who have never won six blue ribbons over fences in equitation, and who have not shown over fences exceeding 3’ within the last 10 years. BABY GREEN HUNTER: Open to horses who have not won three classes over fences in the same show season and have never shown higher than 2’6”. CHILDREN’S/AA HUNTER: Open to Junior and Amateur riders (division to be split if entries warrant). Fences 2’9”. or 3’0” - 3’3”, with riders jumping the same height throughout the division. OPEN HIGH/LOW HUNTER: Same as High/Low Junior/Amateur Hunters, but open to all riders. JUMPER CLASSES: Children’s/AA Jumpers is open to Junior and Amateur riders only. A horse rider combination may only span three levels at any given horse show.